In this tutorial let us learn how to send E-mails from PIC Microcontroller using famous WiFi module the ESP8266. This tutorial uses PIC16F877A IC and MPLABX and XC8 compiler for programming. Step 1: Visit https://www.smtp2go.com/ and Sign up as a new user. Enter your name, E-mail address and password of your E-mail ID from which you want to send the mail. This tutorial uses the Mail ID: aswinthcd@ gmail.com and Password: circuitdigest. Step 3: It might ask for a password again, if asked enter the previous password. In this case it is 'circuitdigest'. Then you will be logged in to the SMPT2GO website. 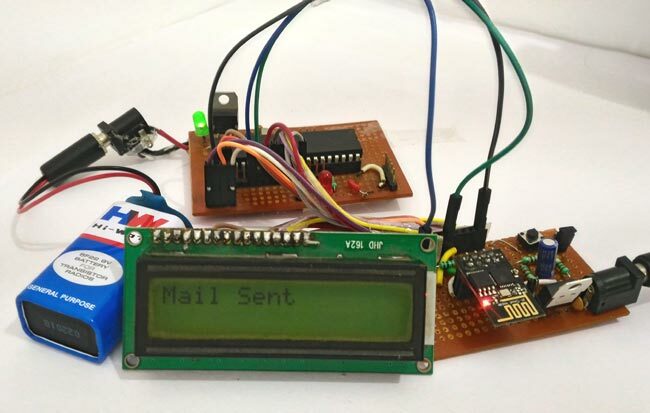 That is it now your E-mail address is ready to send mails using the ESP8266 Module. In this case the encoded values will look as shown in table below. The complete schematic of the project is shown below. The LCD display is used here for debugging purpose. It is not mandatory for you to connect this. The program will work fine even without the LCD display. If you want to know more about the schematics you visit this tutorial. (Interfacing PIC with ESP). You can simply assemble this circuit on a breadboard and then proceed with the programming. In order to send an E-mail from the ESP8266 a sequence of AT commands has to be sent to the ESP module. The following steps have to be followed to send an E-mail from ESP8266. It is a bit lengthy and tedious process but do not worry. I have simplified the process by creating a header file and you can use it directly by just calling some functions (explained below) which makes this task very easy. The complete code along with the header file can be downloaded from here. Note: If you are using the code in a new project make sure you download the header file and add it in your project. I have explained some important parts of the code below, the other parts are self explanatory. But if you have any doubts feel free to use the comment section. }while (!esp8266_isStarted()); //wait till the ESP send back "OK"
This part of the code is used to check if there is a proper communication established between the PIC and ESP8266. Only if, both of them could send and receive data through USART the program will proceed to next step. This function will set the ESP8266 in mode 3. Meaning the module can now act as a Access point and also as a server. This function is used to connect your ESP8266 module to your Wifi Router. In this case “BPAS home” is the name of my Wifi signal and “cracksun” is my password. You have to use your own Wifi signal details. These two functions are used to enable multiple connections and create a server on port 80. Now, using this function we can establish a TCP connection with SMPT2GO. Once the connection is establish this function also moves to the Login page of the website. Use this function to enter your Email ID and password in base 64 format. As you can see these encoded values are same as that shown in the table above. Your encoded values will vary based on your E-mail ID and password. This function is used to define the name of the sender ID. In this tutorial I am sending the mail using my Gmail ID aswinthcd@ gmail.com hence I have passed it as a parameter. This function instructs the SMPT2GO server that we are going to feed in the subject and body of the mail and makes it prepared for the same. You can use this function to define the subject of the mail. As an example I have used “Mail from ESP8266” as the subject of the mail. After entering the subject you can enter the body of the mail using this function. As an example I have set “Testing Success –CircuitDigest” as the body of my mail. Finally after sending the mail, we have to terminate the TCP connection with the SMPT2GO server. This is done by using the above function. Once you are done with your hardware and program. Simply dump the code into you PIC MCU. Then power ON your circuit. If everything goes as expected, your LCD should display the status of the process and finally end up saying “Mail sent” as shown in the video below. Your hardware might look something like this. Once the LCD shows that the mail is sent, check your Inbox and Spam folder for the sent mail. You should have received the mail as shown below..
That is it now you can make your own IOT projects by reading a sensor data and sending them to your mail ID. Create a Security alert system for your home or automobiles by triggering an alert through mail. If you have any doubt or go stuck in the middle kindly use the comment section and I will be happy to help you out. Lcd_Print_String("Connected 2 WIFI"); //Print on LCD for debugging. Excellent work mate. I just write to say thank you for sharing this knowledge. Keep up the good work. Thanks Rafael, your comments encourage me!! so in your project your house wifi will be access point and esp8266 will be access point? what if i want create my own access point is it possible? I want to get a email message, when it detect someone using pir sensor. Yes it is very much possible and easy. Just start by learning to use ESP8266 Using AT commands. Infact for this project you will not need any MCU like PIC or Arduino since the ESP8266 already comes with PIR sensor. error code #include <xc.h> ?? Would you be interested in doing some minor consulting / code work? I am interested in using the ESP8266 via its USART. Thanks. Thsi is because the ESP module is not set in programming mode. Read the previous tutorials to know how to interface pic with ESP8266. We think basically AT+CIPSTART has an issue. Do we write our own ip address in it or some other procedure is to be folllowed. Meanwhile can you also explain EHLO command and AUTH LOGIN command .. couldnt find it in datasheet of esp8266. The hardware is working perfectly. Even the IP address which we are putting is our own. Still, no mail is being exchanged. It would be naive of you to help us out ! Is it possible to use old c18 compiler for this program ? Thans. I can to use ICD2 tool in order to write firmware into pic? Will it work with XC8?